"Punch magic in the face"
Clarice "Glass" Copper-Cleaver is a down on her luck stuntwoman who finds herself transported to a mysterious cabin on a lake where she is confronted by unusual creatures and finds a summons to save someone who isn't there. With the help of her turtle, Bernard, she must find a way out of this place and hopefully get home in time for her next audition. This is an INTERACTIVE serial novel, meaning at the end of each chapter, readers will vote on what action Glass will take next. How will it all end? You tell me. The Adventures of Glass has not been tagged yet. 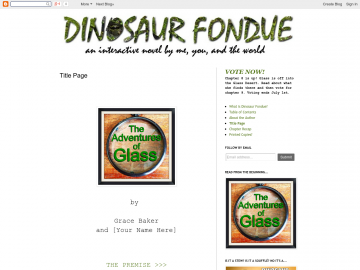 Help others find The Adventures of Glass by tagging it! The Adventures of Glass has not been reviewed yet. The Adventures of Glass has not been recommended yet.